step 2- select text "past"
Submitted by pit3ds on Sat, 2011-03-19 16:37. Submitted by Swordslayer on Sun, 2011-03-20 02:42. There's nothing more straightforward than the align dialog itself. 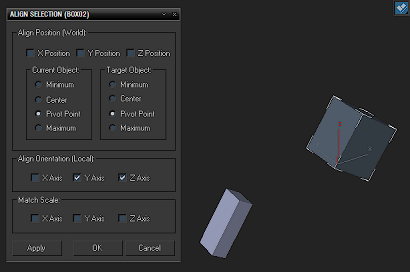 You can either tick all the axes to copy position or tick only the Align Orientation X,Y or Z or all of them to copy rotation and the same goes for the scale. You can tick all the nine checkboxes or just one of them. Give it a try, two clicks extra to uncheck what you don't want to copy doesn't seem like a huge overkill to me. Submitted by Swordslayer on Sat, 2011-03-19 03:09. Well, you don't actually need script for that, Align function already does all of this. Submitted by fajar on Fri, 2011-03-18 10:54.